You are at:Home»Multimedia»Politics of Fashion»Are celebrity culture and fashion the new opium of the people? Celebrity lives are a form of fantasy for people, a distraction from a reality that recently has been overwhelming and pretty dark. Tansy Hoskins is the author of Stitched Up: The Anti-Capitalist Book of Fashion. She has worked for ITN, Stop the War Coalition, Campaign for Nuclear Disarmament, Islam Channel, and appeared as a political commentator on the BBC, Sky News, Al Jazeera and Channel 4’s Ten O’Clock Live. She is interviewed by Phil Hearse, a writer and lecturer who specializes in culture and communication. 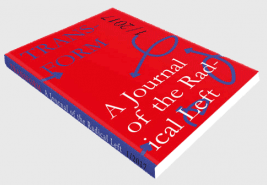 The interview is published in the first issue of Transform, a new journal of the radical left. Phil Hearse: Your book Stitched Up celebrates the creative potential of fashion. But do human beings really need to express themselves through what they wear? Isn’t that a bit superficial? How do you see fashion developing in a post-capitalist society? Tansy Hoskins: Fashion is art, and I think there would be an explosion of art and creativity in a post-capitalist society. At the moment fashion, like much of art, is in the grip of small groups of mostly white male European shareholders with millions of people all but enslaved in fashion’s factories. What we need is for the profiteering to cease and for design to be let off its leash. There is also a tendency to dismiss fashion and dress as art because although it is highly skilled, it is traditionally a woman’s craft. I also don’t see any reason why there has to be a puritan aspect to a post-capitalist society. I would like to see freedom of expression for the individual and an end to rules about what people can wear, rather than more rules or moralising about clothes. At the moment capitalism pretends that it is the ultimate purveyor of freedom but in fact people are hemmed in by rules around gender, sexuality, race, age, class etc. that govern what we wear. Currently fashion is often the only means people have to be creative. In an ideal society there will be more access to music, literature, sculpture, sport etc., so people would hopefully be more fulfilled creatively – but I don’t think that this will mean that enjoyment of clothes and self-expression through the body would cease. Included in this new found freedom of course, is the freedom not to care, or be judged, about how you look or what you wear. PH: Fashion seems to be morphing into a branch of a generic celebrity industry, or perhaps celebrities are being dragged into the fashion industry. Runway models -whose names were unknown 40 years ago – are now big stars and for some (Rosie Huntington-Whiteley, Abbey Lee Kershaw, Kate Upton) a route towards movie stardom. At the same time it seems as if movie stars wearing designer outfits on award show red carpets are more important for some designers than their own runway shows. Fashion shows surround themselves with celebrities and Kanye West designs his own fashion line. All in all, fashion seems to have a much bigger space in our culture than 20 or 30 years ago. What explains this? TH: Brands want the magic that our favourite actors and singers feel associated with. When Emma Watson models lipstick for a corporation it is not just Emma Watson peer-ing out from the advert but Hermione Granger from Harry Potter as well – a fictional character that millions of people adore. Celebrity is another layer obscuring the brutal reality of the fashion industry. In turn, celebs want these contracts because they bring in a hell of a lot of money, and are considered prestigious and a way to boost profile. A huge amount of the public’s time is taken up with celebrity news – this means the selling power of a few handfuls of people, whether they are footballers or Hollywood actors, is colossal and the brands want that publicity. It is certainly a generic turn because 99% of what is worn at awards ceremonies is forgettable and pedestrian. In fashion terms, it is safe rather than innovative. It must also be deeply frustrating for fashion designers and students to watch celebrities launch fashion lines or the children of celebrities get hired as fashion photographers. Not a lot of what happens in the fashion industry is fair. PH: In your book you point out that mass fashion reproduces a few weeks’ later cheaper versions of styles that have been in the haute couture shows. Doesn’t that mean that fashion is getting more democratic, is no longer just for the well-off ? TH: It has certainly been argued that fast fashion has made fashion more democratic and that a system where only the rich have access to the creativity and joy of fashion is a deeply unfair one. I think however that there needs to be a serious examining of what we mean by democracy. What we have at the moment is poorer people having access to really rubbish clothes – clothes that fall apart and shoes that wear through and must be quickly replaced, clothes that go out of fashion quickly and become a source of shame, clothes that are riddled with dangerous chemicals with serious health implications. Plus on a global scale, the global working class is being completely screwed by fashion – millions of women in the global south are locked into the poverty of sweatshop fac-tories, the Rana Plaza factory collapsing and killing 1,138 people in 90 seconds, workers being gunned down for ask¬ing for a wage rise, seas drying up, forests being cut down, pollutants clogging our rivers. This fast fashion system exists to benefit people like Armancio Ortega, the owner of Zara who has a personal fortune of $67 billion whilst Bangladeshi workers are paid $68 a month. We have been sold an absolute sham of democracy and the quicker we shut this whole system down and create something based on real democracy and fair¬ness, the better. PH: Guy Debord in his Society of the Spectacle insisted that under modern conditions life presents itself as ‘an immense accumulation of spectacles’ and ‘images de-tached from everyday life’. Fashion of course is not just im¬ages, but don’t you think that modern celebrity depends on an ‘immense accumulation of images’ to be consumed in magazines, social media etc – and that fashion easily fits into that? So that top fashion models are likely to spend much more time being photographed than walking on the runway? Put it another way, there is the real fashion world of material clothes and design, but an enormous linked and parallel world of fashion photography, magazines, websites, celebrities and gossip, which needs the material fashion but almost outweighs it in cultural significance? TH: Fashion is definitely an illusionary practice! The clothes themselves are a small part of the business. It is everything that goes around clothes that makes them so highly regarded – from fashion magazines, to the carefully designed stores, to catwalk shows, celebrity endorsements,and the cultivated myths aroundtop designers. The internet and social media is also changing how brands market their clothes with models more than ever having to turn themselves into brands with selling power of their own. The most profitable areas of apparel are the intangible ones – design, branding, marketing. It is not in manufac¬turing clothes. Brands outsource all their manufacturing and concentrate on creating an image of a lifestyle that they can sell. One positive side to this is that brands are vulnerable to fear of being damaged. Campaigners and trade unions can have leverage if they successfully target a brand over an issue like fair wages or safety. That clothes are king is also a myth because a lot of the profit for fashion companies like Burberry now comes from bric-a-brac like keyrings, belts, perfume, makeup, purses, and so on. A £5,000 coat might be unaffordable for most people, but a £100 keyring that makes you feel like you own a bit of glamour and prestige might be within reach. But again this is not something brands want to be known for. PH: In their writings about popular culture, especially Resistance through Rituals, Stuart Hall and his col¬leagues insisted that popular culture was not just mindless rubbish passively consumed by the masses, but contained the potential to provide the raw materials for the creative self-expression of masses of ordinary, mainly working class, people. Fashion was part of that, for example they wrote about Rude Boys in the 1950s, and Mods and Rockers in the 1960s. But do we see that today and has it happened in recent years – ‘fashion from below’ or fashion as the signifier of rebellious subcultures? TH: Fashion has a long and powerful history of resistance, one moving example is how people taken to Jamaica as slaves shaped the linen they were given into clothes with a distinctly African aesthetic. The linen was supposed to humiliate them and rob them of their cultural practices but instead it was subverted to keep self-identity and rebellion alive and prevent the required psychic-annihilation. More recently there has been Sudanese journalist Lubna Ahmed al-Hussein who was put on trial in Sudan for the ‘indecent act’ of wearing trousers. And the explosion of ‘fat-shion’ bloggers who are teaching self-acceptance is definitely outside of media norms. But above all I would say that the hijab in Europe – and now the USA – has become a very real and serious point of rebellion and tension about which way a society will go and whether there is true freedom. The simple act of personal expression through dress has become an act of rebellion. PH: At the 2014 Super Bowl, Beyoncé led a troupe dressed in sort of ersatz Black Panther outfits, which led to a social media storm between those who thought it legitimate protest (in the light of Black Lives Matter) and those who thought it cheap and inauthentic. What’s your take on this? I guess postmodernists think authenticity is worthless in the era of pastiche and bricolage. TH: The sight of a troupe of black women with Afros and berets certainly made a lot of people uncomfortable in the USA – and I thought that was an excellent thing. I am a big fan of Beyoncé’s ‘Formation’ track and would like to see more political music that deals with issues of inequality, gun crime, and police violence. Beyoncé – whether as a woman or a brand – is undergoing a fascinating political evolution and I look forward to seeing what happens next. I want ideas about feminism and Black Lives Matter to become so popular that they become normal and unstoppable, and Beyoncé is certainly boosting them up the global agenda. It also shows the enduring power of the Black Panther ‘brand’ and the tensions that have not been dealt with by American society. PH: John Berger in Ways of Seeing said that without social envy glamour cannot exist. That’s pretty much putting down fashion to upper class conspicuous consumption, and high fashion at least to be a series of signs that are signifiers of wealth and power. Isn’t the fashion world full of very reactionary people of immense wealth and power, providing luxury items to their class peers? How many socialists will you find among the people invited to a front rank designer’s show? TH: Class is absolutely the driving factor behind the fashion industry. For centuries fashionable clothing has been a means for wealthy people to differentiate themselves from people they view as beneath them. As soon as a fashion trickles down to the middle classes it becomes a source of horror and the horrified rich are propelled to find something new as a means of differentiating themselves. The simplest way to prove your wealth is to attach expensive objects to your body and walk around, that is what much of the industry is about. Certainly for many designers they are caught in the milieu of the rich and powerful and will do whatever is required of them – a low point for fashion designers is Paris during the Nazi occupation where designers such as Christian Dior, Cristóbal Balenciaga and the Vuittons all served the occupying Nazi forc¬es. Gabrielle Chanel also did but she seems to have been far more ideologically motivated by fascism. That said, there is a difference between the fashion industry and fashion itself which I tend to define as changing styles of dress adopted by groups of people. Certainly there exist many brilliant socially minded fashion designers who use their work to advocate for change, Katharine Hamnett being one famous example today and there are countless lesser known people combining design and activism. Historically there are women like Popova and Stepanova, the Bolshevik Russian fashion designers who believed fashion evokes the spirit of the times. Then there are the millions of people who are not part of the scheming at the top but who love fashion either because their present is bleak, as Berger would say, or because it is their true outlet for creativity and joy. 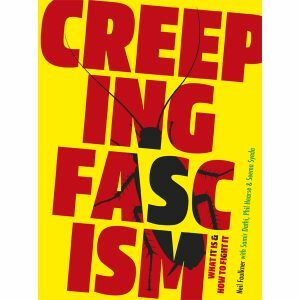 PH: German philosopher Jürgen Habermas claims that the ‘lifeworld’ of the masses has been seized by reactionary popular culture in commodity capitalism, much like the view of Adorno and Horkheimer in the 1960s. For Habermas the masses have been lobotomised and it’s all over for critical thought. Perhaps it’s significant that celebrity culture, so strong today, was also strong in the crisis-ridden 1930s – with the great economic slump, a renewed fascination with the rich and famous. Sections of the masses, especially the young masses, seem to seek continual diversion in following the lives of celebrities. The Instagram and Snapchats feed are endless. So is celebrity culture and its glamour component a new opiate of the people, dulling their critical faculties and preventing critical thought? TH: “The more monotonous the present, the more the imagination must seize upon the future,” argued John Berger. Many people are stuck in lives and jobs that lack meaning or fulfilment. Celebrity lives are a form of fantasy for people, a distraction from a reality that recently has been overwhelming and pretty dark. In the 1930s, movie stars dripping in pearls and mink were so far from the reality of the dust-bowl depression and again today £10,000 handbags and private yachts are not something 99% of people will experience. But wealth-hoarding is what people get taught to dream about so that they don’t start thinking about the real reasons they have no money and about how society could be truly fair and equal. Social media certainly has an extraordinary reach and influence in today’s society and issues like the ‘facebook facelift’ and online bullying are definitely deeply negative. 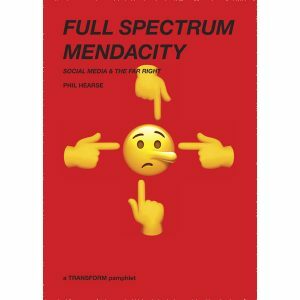 However social media also has the ability to connect people who were previously isolated from likeminded people – whether that’s LGBTQ kids in the Mid-West or people looking for their first protest to attend. If social media is changing our brain functions and attention spans then that is worrying and I guess it is up to all of us to create things, whether that is books, classes, events, demonstrations, films, music, or discussion groups that are more diverting than Snapchat. 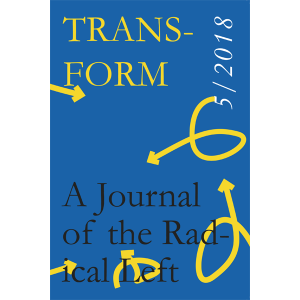 This interview is published in the first issue of Transform, a new journal of the radical left.